I am a massive fan of Depeche Mode. And I really like the latest album, Playing the Angel, as I said previously. Everything is maxed out!!! 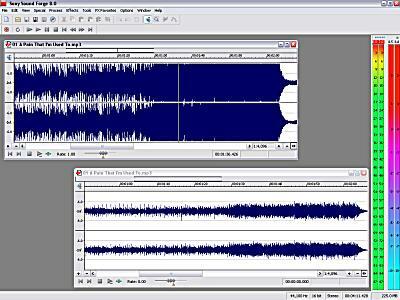 The peak level is 0dB (on the left) as is the average level (on the right). Hence, the dynamics of the chorus is (a completely pathetic) 0dB!!! For those of you who are not too conversant with audio and music, dynamics is what makes music interesting. The average level of music must be much lower than the peak level i.e. music must be most of the time soft but sometimes should become very loud. It must not be loud from start to end or else it will sound unnatural and your ears will feel some discomfort. So, what do we do? Forget about Playing the Angel? If you have bought the “normal” CD then you don’t have any choice. Listen to the crap sound! A perfect sounding MP3 of A Pain that I’m Used To! Sorry to post this here, but I couldn’t find a contact … I listed your blog as a “Live Demo” of the 11:05 theme because yours is done so well! I hope this is O.K. You get a bunch of traffic for it, plus a link on a page with a Google Page Rank of 6. Thanks! And keep on the good work, 11:05 rocks! You like Depeche Mode but not Playing the Angels? I understand that for those proponents of anti music piracy, buying the CD is more an act of appreciation of the artist’s work. But why buy the whole if one enjoys only one. I’ve read in Newsweek last year that anything apart from ‘Playing the Angel’ isn’t worth a cent! Btw, I prefer listening to Jean Michel Jarre on my lazy Sunday afternoons esp. Zoolook, Musique pour SupermarchÃ©s, and the classy OxygÃ¨ne. Forget the voices and listen to sth unique! I really like Playing the Angel but the audio on the CD is crap compared to the Dolby Digital mix on the DVD. By the way, Newsweek is wrong : most of the albums done by Depeche Mode are really good. Perhaps it’s you did not well read my sentence. Their new album is totally crappy except for Playing the Angels. They said nothing about the previous ones. And they sound crap. I don’t know if I’m old or not but I’ve been having some problems listening to the latest albums lately. And I actually can’t listen to the radio at all except at extremely low volume as the distortion is excruciating!